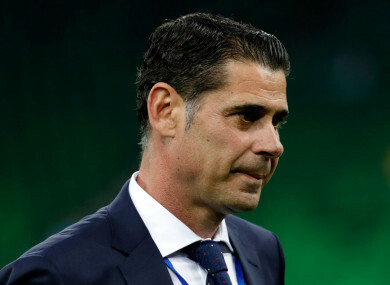 Fernando Hierro is the new Spain boss after Julen Lopetegui’s shock departure two days before World Cup debut. FERNANDO HIERRO SAYS there is no time for Spain to lament their pre-World Cup plans being left in disarray by the shock dismissal of Julen Lopetegui. The Royal Spanish Football Federation announced on Wednesday, the eve of the finals, that Lopetegui had been sacked, just 24 hours after it was confirmed he would take over at Real Madrid following the tournament. Hierro, a former captain of La Roja whose international career spanned from 1989 to 2002, has assumed the reins for the World Cup, where Spain must first tackle a Group B consisting of Portugal, Iran and Morocco. And the retired defender insists that rather than rue their chaotic preparations, the 2010 winners must move on swiftly, with Cristiano Ronaldo and the reigning European champions looming as their opening test in Sochi on Friday. The players are excited, they want this challenge, it’s a challenge for everyone, we do not have time to regret,” he told a media conference. “We have to be positive, opinions are not valid here, we have to turn the page, be positive, think about the players in the squad and what we represent. “We came to fight for the World Cup, the team is excited, we have a great opportunity and that must be the focus. I know that they are going to give up their soul and give 100% in a World Cup … we all know what this means. The response I’ve received is fantastic, it’s a united group, they know their goals. Hierro, a five-time La Liga winner as well a European champion on three occasions with Madrid, offered his best wishes to Lopetegui. “My highest admiration for Julen Lopetegui. I wish you the best of luck,” he said. Email “'We do not have time to regret:' Hierro looking ahead with Spain after Lopetegui sacking”. Feedback on “'We do not have time to regret:' Hierro looking ahead with Spain after Lopetegui sacking”.